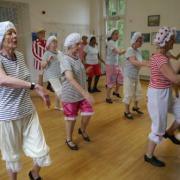 The Second Half Centre is a new and lively centre in North Kensington for people aged 50+. Based in St. Charles Centre for Health and Wellbeing, The Second Half Centre provides over 60 hours of activity a week. Activities range from physical exercise classes such as bokwa and stretch & tone, to creative arts, including mosaics and painting, languages, computer courses and much more! 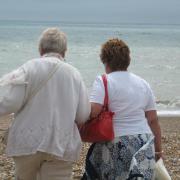 The centre offers an opportunity for older people to develop new skills, meet new people and keep active. For further information call the centre on 0208 962 5500. The Singing for All group performed at Notting Hill Christmas Festival. A video of their performance is here. As part of this year's London Creativity and Wellbeing Week the Second Half Centre held a series of workshops, performances and exhibited members work, all around the theme of 'Under the Sea'. Bus Pass to Broadway performed a medley of saucy seaside songs including 'oh I do like to be beside the seaside' and the French class sang about 'la mer'.